Designed in the Netherlands by Noxon AB and produced by the Hong Kong-based company COMX World Operations Limited - a trading-name of Video Technology - the little-known ComX 35 was if nothing else unusual for the fact that it claimed a processor used "in satellites and the Space Shuttle". This was the RCA CPD-1802, as used in the Voyager, Viking and Gallileo missions because it was actually radiation proof. The problem would be that any processor used in space hardware is by definition well-proved and thus several years old - NASA would never fly the latest and greatest chips. The machine had a minimalist BASIC dialect and poor graphics and came with a "massive", if oddly-sized, 35K memory. This was made up by a conventional 32K block plus an extra 3K for video). It retailed for £150 all in - about £500 in 2019. Video Technology was producing several similar nondescript micros at the same time, including the ill-fated Laser 200. The laser had first appeared as the Texet, before the company linked up with Leisure Zone to promote the machine via Computers For All. 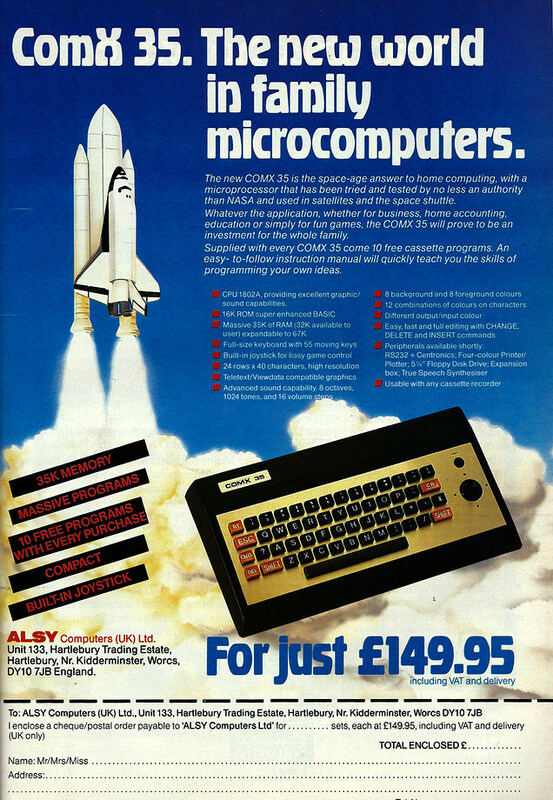 After Leisure Zone and Video Technology parted ways, Computers For All became the sole distributor, before it announced in the February of 1984 that "due to financial difficulties" it had ceased trading. The Laser had not been taken up by any of the High Street shops and there was no software available for it, which wouldn't have helped.